1960 Alfa Romeo Romeo 2 Diesel Owner's Manual. 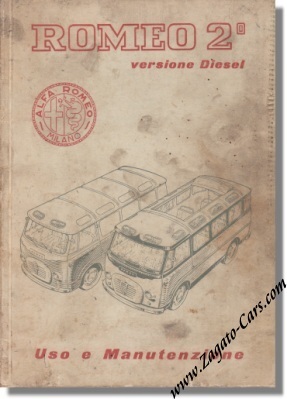 Vintage January 1960 owners manual for the Alfa Romeo Romeo 2e Diesel Van & Pick-up. It measures some 6 x 8 inches or 15 x 20 cm and counts 65 pages + a fold-out wiring diagram. Print reference: N. 703 1/960 - (2000), printed in Italy by Alfieri & Lacroix in Milano. Good condition but "greasy fingers" on the cover. We offer FREE shipping to ANY destination in the world on this item but given its value and rarity, we advise you to take the optional insurance (available at check-out) on it.